You may have heard that a clean vehicle drives better than a dirty one. We’ve always found this to be true, which is why we offer the area’s best car wash services to complement the area’s best auto services. Looking good is usually the first step in feeling good. A new wash for your car is like a new hair-do, a new pair of shoes, or a new outfit; it changes your whole look. We can think of no better way to finish our exceptional auto services, than by directing you to our superior car wash services. As soon as your vehicle is strong and ready for the road, it should also look the part. Let Dynamic Automotive in Urbana, MD give your vehicle a thorough cleaning with our variety of car wash and detailing packages. From a Tsunami Car Wash with light show, to a complete engine clean and detail, we have all of your vehicle’s cleaning needs covered. 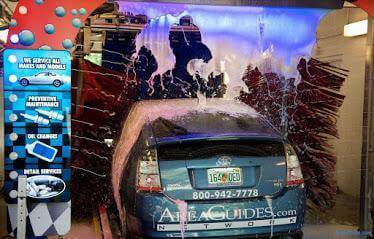 Each car wash package adds more features to meet your car washing needs no matter how dirty your car is. Our services can clean your vehicle inside and out, from top to bottom, and from headlights to taillights. We always thoroughly clean your tires with a tire scrubber, and use a variety of soaps for optimal cleanliness. The hard to reach and hard to clean areas like under the car, receive our extra attention. At Dynamic Automotive our detailing packages cover all vehicle sizes. Whether your vehicle is standard sized, an SUV, a minivan, or full sized, we offer a package just for you. You can get your vehicles interior or exterior detailed with our Basic, Semi, or Mega services. For the Ultimate Detail you can get both Mega Interior and Mega Exterior for any size vehicle. Our car wash service is unmatched in this area, and we use the same commitment to excellence for our car wash service that we use for our auto service. Stop by today to receive this area’s premium car wash and detailing service.